It took 2 nukes to get anime. I wonder what a third would create. @Captain Anderson, China's crimes against humanity are always under reported but it's terrible there. @Captain Anderson, North Korea steals most of its negative publicity, and deservedly so, but a lot of people don’t seem to realize how disturbing and corrupt China really is. DC. Let’s kick start this political revolution. Maralargo, because a)Trump and b) Florida DC again, because Fallout 3. Same as last time. Sell them. This time I might keep one, though, as a bargaining tool. @big freedom, good luck without us! @Kareem Abdul Ackbar, I lived there for 15 years. Trust me, the rest of the country will be fine. @Kareem Abdul Ackbar, people are just jealous of us because we have the best housing prices and they don’t. @Diabolik, we also have the fifth largest economy in the world. I firmly believe that the hatred for California is a case of “they hate us cause they ain’t us.” Why would people bother hating a state that has a larger economy and population than them? May as hate humans in general since large groups of them are so despicable. 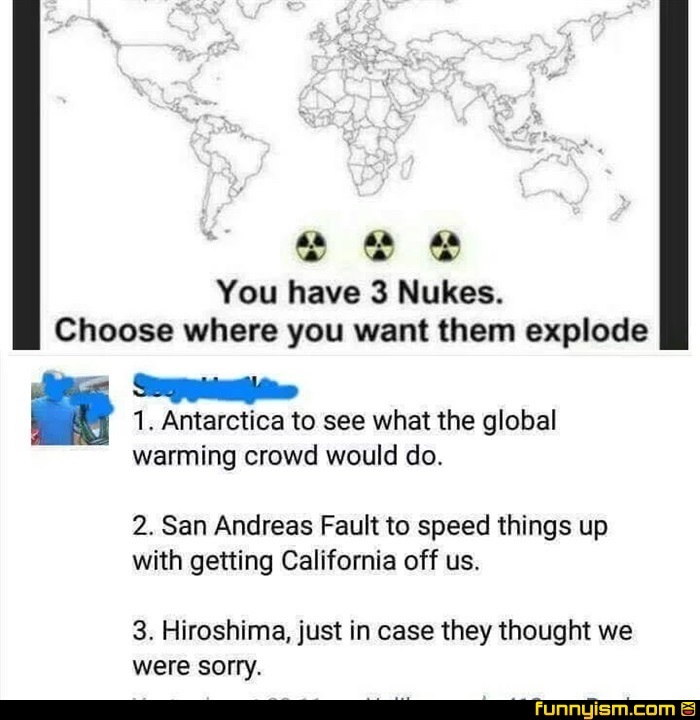 Wouldn't it actually refreeze the polar ice caps after the initial explosion? How big is the blast radius?